All colors, leathers and fabric available. Stressless E200 Loveseat- Enjoy Stress-free Ordering and Delivery at Unwind. Feel the daily stress and discomfort disappear when you order a Stressless E200 loveseat from The Unwind Company. We also delivery Fully-Assembled, Brand-New items right through the front door of your business or home with the Fastest Shipping Methods available. Our Delivery Options can have Recliners available for Immediate-Shipping delivered to virtually anywhere in North America in 1-5 business days. There's no need to pay for standard shipping when you can have priority shipping at no additional cost. All of our items are backed by the rock-solid 10 year Manufacturer's Warranty at no additional cost. You can truly relax and unwind when you choose the world's most advanced recliners. From the patented technologies, to the outstanding construction and engineering, down to the incredibly useful accessories, you will be able to relieve stress and tension and promote a genuine sense of well-being in this seating solution. Ships Fast & Worry-free Nationwide at Unwind.com. The Stressless E200 loveseat is fabulous. It boasts wide seat cushions, smooth edges, and an overall appeal to virtually any decor. The Ergo Adapt technology is a phenomenal adaptation of the Patented Plus System that allows you a "fixed-back" sofa appearance while providing ultimate levels of reclining comfort. There are 3 models utilizing the Ergo Adapt Tech: E200, 300 & E40 models. The E300 & E40 models differ only slightly in styling and appearance, underneath its all the same, great Stressless technology. As with all other products from Ekornes, these models are ultra comfortable and backed by a 10-Year warranty. This system is activated once you sit down. The inner frame, or skeleton if you will, is designed to move and adapt with your body weight. As you sit down, or lean back, the frame tilts and moves to allow proper weight-displacement to ensure your back and body are always in the exact position for maximum comfort. It is a modified version of the "Plus System" found in all other Stressless sofas. 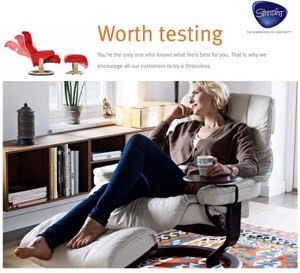 Ekornes wanted you to experience the ultimate in comfort not just sitting. This "Ergo Adapt" system is intelligent enough to recognize when you are laying down on your sofa. It will correct itself and lay flat so you have a smooth, comfortable surface to lay down and rest upon. This is truly comfort-driven science. The customization options for your E200 sofa are virtually limitless! You can select from 50+ colors, 4 different leather types, 6 different fabrics, and 2 different leg types. In case you were wondering, that means there are 1000s of potential designs and options for you to choose from! Ekornes is renowned not only for its premium leathers but for its exquisite fabrics. There are 4 types of leather available and 6 types of fabrics. Batick, Paloma, Classic, and Royalin are 100%, premium, top-grain leathers. They go through a rigorous screening process to ensure only the finest hides are used as leather upholstery. Each leather type has a specific set of characteristics that set it apart from each other. Visit our[Leather Info Page] to learn more and to assist you in selecting the perfect leather for your home or office. Stella, Ocean, Luna, Verona, Siena, & Dinamica are all fabrics produced at Ekornes that meet the highest standards in international quality. Whether you prefer a velvety smooth fabric, or a durable, loose-knit yarn-texture fabric, there is a fabric just for you. They are not only amazingly designed but they are also available at a lower price than the leather selections offered. Dinamica fabric is the most premier fabric and is equal in price to the Batick leather option. There are so many color options when it comes to fabric coverings for your Stressless Furniture. We want to help you save money on Stressless Sofas and Ekornes Furniture. Starting in 2014, there will be 4 select colors in Batick Leather and 4 select colors in Paloma leather that are available at an instant 20% discount. The average savings is between 18-20%. This applies only to Ekornes Collection Sofas, Stressless sofas and loveseats, Sectionals, Home Theater Seating units & matching sofa ottomans. The colors are: Black, Brown, Burgundy, & Cream Batick leathers and Black, Chocolate, Light Grey, & Sand Paloma leathers. These discounts only save you money, they won't change your delivery time. (delivery times are dependent on the models - many are available to be made to order and ready within a month.) This color chart below shows you which colors/leathers save you money instantly. Ekornes takes individuality to a higher leven by allowing you the option of selecting the specific leg type for your Ekornes Stressless Sofa. There are many leg types available overall and each model generally has 1-2 options. This allows you to even further fit your furniture to your exact, unique, and wonderful tastes. It also is important to note the differing options will not alter the cost if your furniture. We guarantee the lowest, authorized prices on Stressless products. You can have either Steel or Wood around Legs on the E200 model sofas. The wood is available in many of 7 standard wood stain colors available from Ekornes. View the images in your catalog or to the right to see the available leg options for this model. Let's take it a step further and bring you into the Sectionals of Stressless. The E200, E300, E40, Arion, Eldorado, Legend, Paradise, Space, and Wave sofas can be designed into sectional pieces. The Stressless Liberty will be available for Sectional design starting July 1, 2014. Stay tuned as we bring you more details about the sectional options for the Liberty line. If you would like, check out our [Sectionals Page] to view wear already designed sectionals and the various components so you can design your own! Below are various layouts for sectional designs. These are basic and can be altered to your tastes in almost any way imagined. The ability to coordinate your entire room is important. Being physically realxed is foremost, but being visually relaxed is a contributing factor to overall well-being. Get a matching Stressless Recliner is probably one of the best features of the Sofas and Ekornes Furniture. The E200 line goes one step further than other Stressless Sofas by having multiple matching recliners for your choosing. The Orion recliner and Stressless Jazz both match this series. The Orion with its more boxy, straight-lines has a simplistic feel to it. Whereas the Jazz, is more contemporary in its fluid lines and bright steel accents. Check out their product pages to learn more. If you are looking for the E300 & E40 models click here: [Stressless E300 Sofa] or [Stressless E40]. It is very easy to confuse these 3 models. They are very similar. The primary differences are in the styling and the amount of padding. The E200 models are more boxy with clean, straight edges and the E300 is more rounded with softer corners. The more padded, over-stuffed model is the E40. In addition to matching recliners, there are matching ottomans and tables available to you. Get them in matching leather, fabric or wood stains to coordinate with your Stressless furniture. The list of items available is far too extensive to name here. Check out the category page to see all the items: [Stressless Ottomans & Tables]. The newest, matching accessory is the [Stressless Coffee Table]. Check it out! We can go on for an infinite amount of time discussing the many benefits to owning Stressless furniture. Ultimately, it's up to you to find the perfect seat. Use the Stressless Question List known as "the Comfort Test". Check it out at your nearest Unwind Retail Location (or nearest local retailer). Make sure the chair is big enough for you. Does it feel like there is not enough support for your head, shoulders and back? You should feel that your entire back is supported, almost cradled, by the cushion of the chair. Your head should be adequately supported so as to relax your neck. If the chair is too large or the headrest is too big for your body type, you may feel as if your head is being pushed forward. Another indicator of a too large seat would be if your elbows do not reach the arm rests. This will surely indicate you need a smaller seat. Does this chair feel large enough to support your whole body? Check out the ottoman. Are your legs at a comfortable height? Different ottomans and models have different heights for your legs. Sometimes the ottoman may be too far or too close to the seat. Simply adjust the distance of the ottoman from the seat until you feel your legs are properly supported. Can you easily recline? If your seat is too large it may feel a bit forced to lean the seat back and recline. If it is too small of a chair, it may feel as if you aren't reclining very far back. This to can be a simple fix. If you think you are in the right sized seat for your body type, then check the Glide Wheels to ensure they are not too loose or over-tightened. The location of the lumbar support can reveal if you are in the right sized seat. If the lumbar support is too high, the chair is too big and you need to go down a size. If the lumbar is too low or is hard to feel, the chair is most likely too small for you. Make sure you can see directly in front of you. If the headrest and/or are too big, it will be difficult to see when reclining. If things are too small, you may be lacking in the necessary head support. Thus, you will not be getting the most comfort possible out of you our Stressless. The final question to ask yourself is: Which upholstery option feels best? It is important that you figure out the upholstery that will not only look great and feel great but will be designed for environmental factors. For example, Royalin is the finest leather grade available. But if your furniture is going on a yacht, or in a sunroom, you must consider the amount of direct exposure to Sunlight. Excessive UV exposure can cause premature aging of your Royalin leather, if not properly conditioned and treated. So far, We have provided information explaining what sets Ekornes apart from all other furniture in the world. Let us explain what sets The Unwind Company apart. Fast Shipping, no hidden charges or fees, sales tax benefits, your items either always ship fully assembled and we send them via multiple delivery options. Shop confidently knowing Unwind maintains an A+ rating with the BBB, with millions served. May we assist you as well? We'll always do our very best to get you taken care of- We guarantee it!. We have 1000s of items in stock for quick shipping. A "stress-free" shopping experience. We have made a commitment to not only striving for 100% Customer Satisfaction but also to providing the most courteous and prompt service in the furniture industry. Unwind Express Delivery - Want same-day delivery? Get an in-stock item and select "Unwind Express Delivery". To Learn more, click here:[Fastest Delivery Around]. We have a team of and friendly and knowledgeable Ekornes Specialists. They are available and ready to assist you. After-Hours Live Support via our online Chat Program. We are able to handle and service warranty issues worldwide. We can ship anywhere in the continental United States. We ship to many places in Canada. There are numerous places worldwide we can ship to as well! Unwind accepts all major credit cards and Paypal. Use Paypal to take advantage of 6 months, interest-free purchases of qualified items over $99. Click the image below to learn more. We are always eager to chat with you. Drop us a buzz at 888-486-9463 for more information about our products or to place an order. Stressless E200 Love Seat Dimensions are: Width: 67.75" Height: 28.75" Depth: 37.75"
Width: 67.75" Height: 28.75" Depth: 37.75"